Zane brought homework from school. I sat down next to him, to keep him on track and to clarify any questions that might arise. 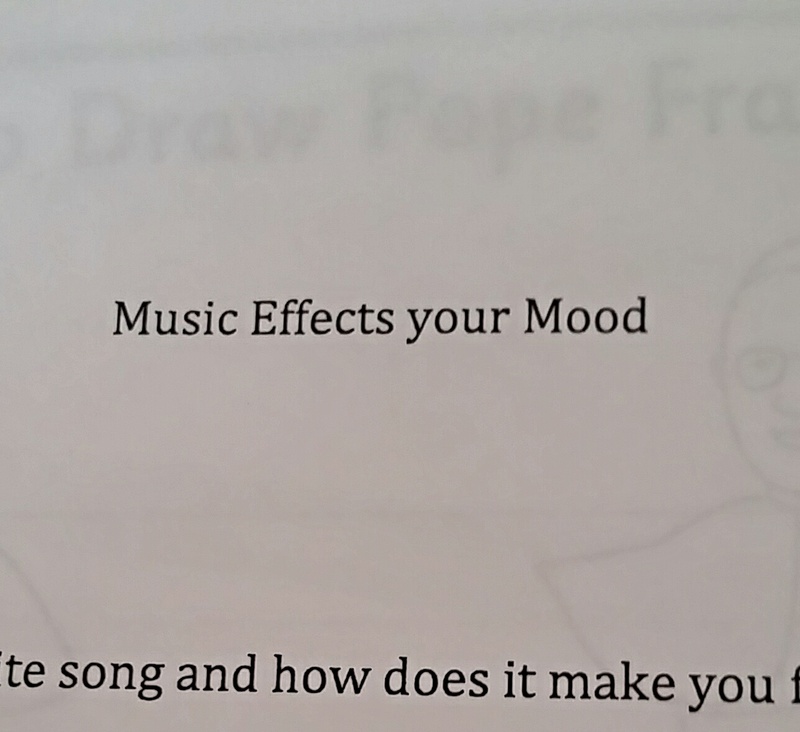 Zane handed me the worksheet, where I read: "MUSIC EFFECTS YOUR MOOD". I then went upstairs to get my glasses, just to make sure that I was seeing correctly. I love English. It is a fascinating, complex language that is difficult even for those of us who were born speaking it. I'm willing to give a tiny benefit of the doubt to most people when they are trying to communicate and they make a mistake, just because our language is so complex. I usually keep my thoughts to myself. And I mentally take up a red pen and start underlining here, circling there, throwing in a few symbols for capitalization and new paragraphs. Of course, in this situation I can't just speak my thoughts aloud. For me to say that one of Zane's teachers doesn't know her Effect from her Affect, would be counterproductive. It isn't in me to tear down a teacher for a what might just be a rookie mistake with spell check, anyway. Zane might also have some confusion over my explanation, even if he can repeat my exact words verbatim to his entire class. My red pen use would also upset random people. As a writer, I know how it feels, seeing red ink scribbled all over my papers. While my intent is always to help, I'd be the first to say that even constructive criticism might not be well received. I'd rather not have to deal with any hurt feelings and wounded egos, unless they are mine and also involve a quart of ice cream and a special vintage of boxed wine. 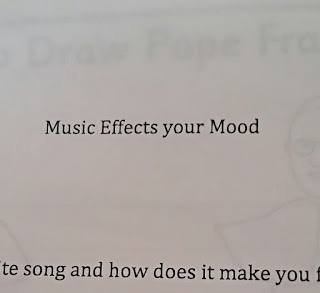 Music influences your mood? I ran with that. Zane completed the homework, with nary a histrionic comment from me. I mentally patted myself on the back for my restraint. Oh, I would have had to comment. If the person had used affect/effect wrong outside of school. Who cares? But a place of learning? You did the right thing. Pick your battles and Don't ruffle feathers. It will effect you. It is there cross to bare.